Oleg Dubrov posted in Issue with armory and intellij 2016.2.2. Oleg Dubrov posted in Missing cursor in editor and show members option. Thanks a lot for details! Issue fix is in progress.. Thank you for the bug report. We are trying to reproduce the bug with cursor. What type of file are you trying to open? Oleg Dubrov posted in Reuse in multiple IDEs?. Oleg Dubrov posted in Hiding Elements. @mmadson how would I go about doing that easily? 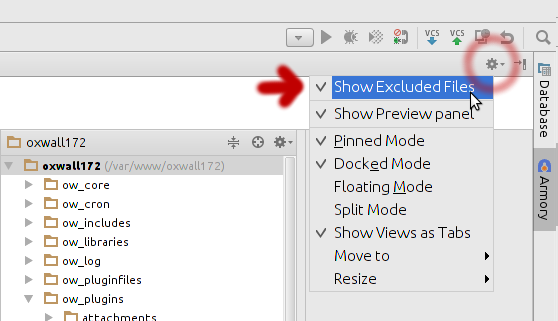 If you want to hide some folders from the view, you may mark it "as excluded". 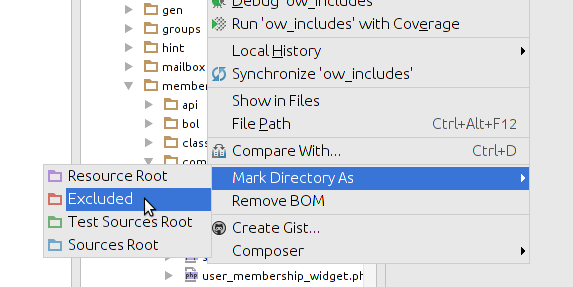 It is not the Armory plugin functionality, it's available in almost all jetbrains' IDE. To create empty tree view, just click "Add Tree View" and then "Clear" to remove existing roots from it. Isn't it exactly what you need? The other way to hide "unwanted items" is to select all of them an choose "Group" in the context menu (Ctrl + Right Click). Give the name of group (for example 'etc') and click OK. Done. The third way to manage with that is instead of to gray "hidden" items, to bold the "important" items by selecting them and pressing Ctrl+B. Please correct me if I have misunderstood you. Could you make a screenshot and point out the place and what should be changed? Oleg Dubrov posted in Roots vertically?. Oleg Dubrov posted in How to hide toolbar and preview panel?. I'm sorry, it isn't possible at the time. Maybe in future releases this will be done.